In this section, we re-examine a masterpiece from the brilliant late Polish poet Czesław Miłosz, entitled “Bypassing Rue Descartes”, and recall the lasting relevance of several of his other works. A young barbarian just come to the capital of the world. Choral prayers recited by master and household together. I entered the universal, dazzled and desiring. Would be killed because they wanted to abolish the customs of their homes. In order to kill in the name of the universal, beautiful ideas. Into arias hardly audible and into turns of speech. Where empires have fallen and those once living are now dead. And now I know that the time of human generations is not like the time of the earth. I pushed a rock down onto a water snake coiled in the grass. Which reaches, sooner of later, the breaker of a taboo. Pondering upon the map of Paris, one might find it quite unreasonable, if not awkward, to descend towards the Seine by bypassing Rue Descartes. Even in the unlikely case that Miłosz in Paris had become willy-nilly, the strange choice might suggest that he had ventured to take advantage of his licentia poetica. But it certainly wouldn’t be unheard of for a poet to wonder on his or her own path. This time, however, Miłosz “travels through underworlds” of European history with a resolute purpose, and he starts by bypassing Descartes Street. Worthy of mention is that Miłosz was a traveler at heart; and not only because he had been forced to leave communist Poland soon after his escape from “Hegel’s bite” (his youthful Marxist fascinations). He had been, also, an emigrant for almost half a century (or maybe even longer, considering his “native realm” in the provincial townships of ex-Grand Duchy of Lithuania had vanished once and for all following the attack of the Soviet Union, then an ally of Nazi Germany, on Poland on 17 September, 1939). As Miłosz lived his life, he was a traveler, too, in the method he employed in his writing, for, if Joyce’s style be a stream of consciousness, Miłosz’s narrative model can be described as a path, following along such notable works as “An Excursion through the Twenties and Thirties”, “Native Realm”, and “The Issa Valley”. Interestingly enough, Miłosz was rather sceptical of the “slang of social sciences” that had come to characterize the contemporary humanities, and leaned with a preference toward the old-fashioned language of philosopher-anderers enumerating the likes of Astolphe de Custine and Alexis de Tocqueville. His “descent toward the Seine”, therefore, is not just some leisurely, sentimental stroll that indulged to choose Rue Descartes over all the other worthy Parisian cobblestone trottoirs, but a matter of philosophy, some philosphia perennis, an essential truth-seeking. Though the poem was written in 1980, its opening verses actually refer to the early thirties, when Miłosz, a shy barbarian, had first come to the capital of the world. The poem also consists of a reminiscence of the trip he describes in “The Native Realm”, to which, also, I make mention in another article. Thus, the poet continues the stroll he had begun some 50 years prior. What’s wrong with “Rue Descartes”? As the fabulous Historical Dictionary of the Streets of Paris informs us, the street originates from the 13th century. But until 1809, it had carried the name “Brothels Street”. And honestly, be it Brothels Street or Descartes Street, it’s still awkard to bypaas it descending towards the Seine. Well, it’s not that important. What really matters is who this person Descartes was to have become the patron of a street in the centre of post-revolutionary Paris. 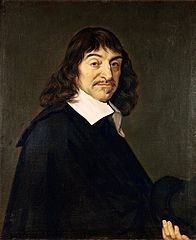 Actually, Descartes is widely considered the forefather of modern philosophy. What, then, are the cornerstones of this modern philosophy according to his self-proclaimed sons? “I think therefore I am,” said Cartesius: the essence of the human being residing in his or her capacity for reason, the mathematical intellect alone had to be the only credible sense. Not religion, feelings, or experience—just the pure rationalist method could provide the lens through which to see the world “clearly and distinctively”. Therefore, the world should not be confessed out of its mysteries but mathematicisied into plain rules—as long as this is the only language in which we can discuss the matter in accordance with the established principles of truth. Paris used to be the core of the interwar world; the capital of a bored, decadent, elegant and wealthy, civilly bloody empire. It was the place to go. On one hand, there were those poor economic migrants from Eastern Europe who were “not allowed”; on the other there were the dandies, intellectuals and artists, kindly welcomed, who “walked, of divine Plato dreaming/And of Phidias,/Salamis, Marathon, under twinkling/Eyes, eyes of blue jets of gas,” as Paul Verlaine (a resident on Rue Descartes) sketched the Paris of his times. The core of the world in those days enjoyed passing its own life, “indifferent as it was to honor and shame and greatness and glory”. That was the nature of the city. But the simple men were not entirely mistaken. They lived decent lives, far away from the places where the “wind blows the smoke from the crematory”. A funny thing, most of the cities Miłosz mentions have either undergone a change of name or a change of sovereignty. Koloshvar, for instance, is no longer Kolozsvár, a gem of Hungarian Transylvania, but Cluj-Napoca, a part of contemporary Romania. And let’s not even mention the history of Wilno-Vilnius. Cloudy provinces. What do they have in common? Indefinity. They are those not so well-known peripheries of the world. Not many people know (or even care) where these places were or are exactly. Are they real places even, or just some vague, cloudy symbols decipherable only to the autochthons? Places built upon a quicksand of history, they can only be explained as contingent, not necessary, entities, such as la France eternelle. In one of his works Miłosz dwells on an elderly maid named Alżbieta, who every day hurries (barefooted?) to attend the morning service. She used to be a part of the native realm of Miłosz’s childhood. Those days, he perceived her with some cordial irony. He wouldn’t have blamed her unscientific worldview, but neither would he have followed her to one of the tiny provincial churches of the no longer (if ever) existing peripheral ex-Grand Duchy of Lithuania. Instead Miłosz shyly progressed to the core of the current world. Entire generations of young barbarians who dared to come to the capitals of the world were ashamed to remember the tribal superstitions of their home-wildernesses: choral prayers, incantations, and the remnants of feudalism or paganism are just a few examples of the traditions that had been practically requisites in their cloudy provinces. Miłosz, or, to better examplify, Ho Chi Minh, who renamed Saigon after himself when he had returned home from university in Paris, entered the universal dazzled and desiring. But what do we learn from our abandoned customs? Do we burst into throaty laughter, or perhaps not? Our customs, in essence, remain the reservoirs of the common senses that our forebears accrued so arduously. Indeed, they were not invented by an individual reason, but came from a relative, or common (and always a productively problematic) coexistence. They were not merely drawn from abstract ideas, but were instead created within actual and complex societies. Not always correct, scientifically proven or reasonable, nevertheless these customs showed what “the lesson of biology” (that Miłosz criticised) was not able to express. Perhaps the people were not taught that they are the effect of universal, constant and subsequent biochemical processes, but they must have known (perhaps they were told by “a white-haired old man, who would be a prophet”) that they embodied the particular, individual—if not unique—parts of the community, the awareness of which knowledge implied certain rights, duties, goals and responsibilities. Robert Haas, an American poet, claimed that Miłosz used to share the sense that something terrible was going to happen. But was this going to be a result of “an abstract application of principles based on some Enlightenment idea of universal justice”, or a source from it? Certainly, Miłosz was a classical catastrophist; but was he a pessimist? Not necessarily. Nevertheless, Miłosz was rather disillusioned of the world and history. Soon enough many would be killed because they wanted to abolish the customs; soon enough, their peers would kill in the name of the universal ideas. Is humanity doomed, then, or does it behave in accordance with its nature? Is the sinister, inhuman instinct merely a peoples’ matter? While people are not innocent, they do seem to ignore their own guilt. As in “Child of Europe”, many a person enjoys victorious justice and accepts it as proven. In the end, those who in May admire the trees flowering are better than those who have perished. Hopefully, they were: beautiful and tempting. The attraction to universal ideas came from their potential to consolidate a divergent world—the reality as subject to modification, the society as a result of construction. They sadly claim to originate from science, or, as J.C. Sommervile would say, from the “ideology of metaphysical naturalism”. It truly is a horrific experience to see the scientific justification of totalitarian worldviews. All those elegant disputes of how history would end (and how to make it come true, preferably as quickly as possible) and distinguished considerations of necessities or indispensable costs (victims—so sorry) of progress. 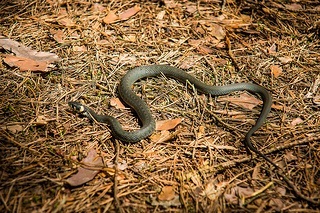 The water snake, or žaltys, is actually a sacred Lithuanian animal. Lithuania was a land that was baptised in the 14th century; thus, the ancient pagan beliefs enjoyed quite a long life there. A mysticist poet and Czesław’s relative, whom Rue Descartes’s author visted with great respect in Paris, Oskar Miłosz, or rather Oskaras Milašius, depicted žaltys as a young man, “a king of snakes”. He wrote that žaltys used to be a friend of the sun goddess Saulė. In reality, a water snake is not dangerous or even aggressive. A žaltys characteristically takes good care of its family, harvest and fertility. Once met, it should be given milk and taken (or invited) to live in a specially chosen place of the house, usually a stove. Killing a water snake was actually thought to cause misfortune, as the household pet (or genius loci) symbolised the keystone of the household’s wealth. Miłosz broke that taboo. Killing the žaltys is his heaviest sin. Even though it wasn’t a crime, as taboos are not the law, it was an act against the native, intimate rules. Do you recall Antigone? She was a woman who found herself in a man’s world burrying her brother against the order legitimated by legal authority. She broke the man-made law to fulfill a duty of a relative. Similarly, killing a žaltys has absolutely no meaning in the light of legal provisions, but the act breaks some informally established natural order. Lillian Vallee, a student of Miłosz’s who has inquired into the archaic traditions of her master’s work, argues that Miłosz was emotionally, or even instinctively, immersed in nature. As she so beautifully wrote, Miłosz “treats nature as a sacred hieroglyph”. Though the regard goes against the Cartesian scientific worldview, it nevertheless refers to some valid, archaic and intimate interrelation between man and nature. Animals or even plants stimulate symbolical thinking. They serve as metaphors, therefore. Miłosz, in turn, uses nature through which to tell his stories. “The Issa Valley”, for example, is a story about a lost world expressing a deeply sentimental landscape mostly symbolically. Another is a scene from “The Native Realm”, in which Miłosz, instead of opting to stay at a hotel in one of the cities he visits in Western Europe, prefers to spend the night in a nearby forest. Thus, Miłosz elevates the forgotten or rejected primordial relic. He seems to be suggesting, as Łukasz Tischner puts it, that “it’s the closest, or the provincial, that in a way is the most important and essential”. “You, Seine, you have nothing. Two platforms, and that’s all,” Verlaine from Rue Descartes writes. First having bypassed Rue Descartes at the age of 20, Miłosz descended to the Seine at the age of 70 and was inadvertantly reminded of the water snake he had killed with a rock in the ancient Lithuanian backwoods when he was an innocent child. And, indeed, in the blue eyes of the poet, there was not the glance of a moralist, but a merciful one; for even when Giordano Bruno was dying lonely on the Campo dei Fiori, the people around him at the time might have been meandering merrily, laughing, or expressing their affection for one another as they passed by the martyr’s pyres—and Miłosz was aware of that. Nevertheless, leaning on the rough granite of the embankment, Miłosz is aware of the existence of evil. And however difficult the conditions in the world may have been, Miłosz kept the line between good and evil unblurred. We tend to ignore the evil. Putting on the masks of of the legal and illegal, the justifiable and unjustifiable, the legitimate and illegitimate. Leaning on the rough granite of one of the two embankments, Miłosz reminds that, for as long as the river of history has flowed, good and evil have existed. Wistfully bypassing Rue Descartes, the poet remembered what he had seen travelling through the underworlds: a just punishment reaches, sooner or later, the breaker of a taboo. Zostawiłem za sobą pochmurne powiaty. Która prędzej czy później łamiącego zakaz dosięgnie.